Dr. Franz Volker Greifenhagen studied the Hebrew Bible and Islam at Duke University, graduating with a Ph.D. in 1998. 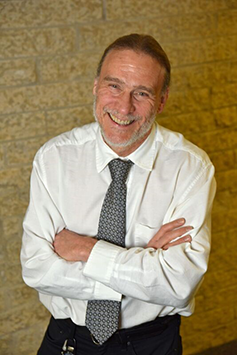 He has taught at Luther College at the University of Regina since 1994 and served the College as Assistant Dean 2005 - 2012, and as Dean 2012 - 2018. Dr. Greifenhagen collaborates on the national research project "New Muslim public spheres in the digital age: identity, community, diversity and authority in Canada", and has authored or co-authored various articles and academic papers on the Qur’an and Bible, and on modern Islam, including a textbook on the Hebrew Bible, An Introduction to the Hebrew Bible: A Thematic Approach. Dr. Greifenhagen teaches in Luther College’s Interdisciplinary Studies Program, received an Inspiring Teacher Award, and has supervised both honours and graduate students. He regularly shares his scholarship with church and community groups. Dr. Greifenhagen grew up in Winnipeg, Manitoba. He is married, with two children, a dog, and a cat. 2013 - 2007, Collaborator, "New Muslim public spheres in the digital age: identity, community, diversity and authority in Canada", Social Sciences and Humanities Research Council of Canada Insight Grant of $482,194 over four years. Principle investigator: Roxanne Marcotte, Université du Québec à Montréal. “Muslim Perceptions of Identity, Community, Diversity and Authority in the Internet Age”, 199-213 in Religion and the Internet, ed. Daniel Enstedt, Göran Larsson & Enzo Pace (Annual Review of the Sociology of Religion). Leiden: Brill, 2015. Lutheran Pedagogy for a Global Context, edited with Peter Vethanayagomony. Minneapolis: Lutheran University Press, 2015. “‘Little Mosque on the Prairie’ and Modern Convivencia: An Intervention into Canadian Muslim Identities”, 129-146 in Muslims and the New Information and Communication Technologies: Notes from an Emerging and Infinite Field, eds. Thomas Hoffmann & Göran Larsson (Muslims in Global Societies Series 7). Dordrecht: Springer, 2013. “Covering Up on the Prairies: Perceptions of Muslim Identity, Multiculturalism and Security in Canada” (with A. Brenda Anderson), 55-72 in Islamic Fashion and Anti-Fashion, eds. Emma Tarlo and Annelies Moors. London: Bloomsbury, 2013. “A Comparison of Genesis 22 to the Qur’an” (30-32), “The Annunciation to Mary in the Qur’an” (312-214) and “A Comparison of Jesus’ Miracles in the Qur’an and the Gospels” (267-270) in Global Perspectives on the Bible, eds. Mark Roncace and Joseph Weaver. Upper Saddle River, N.J.: Pearson Education, 2013. "Qur’an, the Bible in the" (426-427) in the Dictionary of the Bible and Western Culture, eds. Mary Ann Beavis and Michael J. Gilmour. Sheffield: Sheffield Phoenix Press, 2012. “The Fantastical Muslim: Media and Digital Imaginings and Interventions”. Presented with A. Brenda Anderson at the Canadian Society for the Study of Religion, Congress of the Humanities and Social Sciences, Calgary, Alberta, May 30, 2016. “Muslim Digital Spheres in Canada: Framing Research on Transformations of Canadian Muslim Perceptions of Identity, Community, Diversity, and Authority in the Internet Age”. Presented at the Pacific Northwest Regional Meeting of the American Academy of Religion, Calgary, May10, 2014, and at the Canadian Society for the Study of Religion, Congress of the Humanities and Social Sciences, St. Catherines, ON, May 26, 2014. “Mormons and the Qur’an: The Making of Some Theological, Literary and Historical Connections”. Presented at the Pacific Northwest Regional Meeting of the American Academy of Religion, Seattle, May 3, 2013. “Veiled threats? Saskatchewan Muslim women on the interaction of gender, Muslim identity and security perceptions” (with Brenda Anderson). Presented at the RESOLVE (Research and Education for Solutions to Violence and Abuse) Research Day, October 19, 2012. “The Story of Lot/Lūt: Comparative Contemporary Performances of Scripture in Relation to Homosexuality by Christians and Muslims”. Presented at the Pacific Northwest Region Meeting of the American Academy of Religion, Portland, May 12, 2012. “Voice Against Violent Extremism” panel with Rabbi Jeremy Parnes & Imam Navaid Aziz, Intercultural Dialogue Institute, Regina, May 4, 2016. “Listening in the Face of Religious Terror”, with David J. Goa. North American Interfaith Network Connect Conference, Luther College, University of Regina, July 21, 2015. “Seven Things Everyone Needs to Know About Muslims”, Christ Lutheran Church, Regina, April 12, 2015. “Our Muslim Neighbours: A Conversation on Christian Understanding and Relationship”, with David J. Goa. First Lutheran Church, Vancouver, March 27 – 28, 2015. “The Theology of the Cross as a Foundation for Muslim-Christian Dialogue” M.Div. (Lutheran Theological Seminary, Saskatoon), (2010). “The Muslim Identity Crisis: Shari’a as a Mechanism for Decolonization” M.A. (Religious Studies), (2009). “Sayyid al-Qimni and Hans Küng: A Comparative Study of Power Structure and Resistance in Sunni Islam in Egypt and Catholic Christianity in Europe” M.A. (Religious Studies), (2008). “Que(e)r(y)ing the Image of God: Challenging the Heterosexual Myth” M.A. (Religious Studies), (2007).